Like brand-new news regarding Mega Man nowadays, two reviews in one day on SuperPhillip Central seldom ever happens. Today is a special day, however. Mega Man IV recently released on the North American Virtual Console for the Nintendo 3DS. Here's SuperPhillip Central's thoughts on the game in the form of a review! Remember in the early 2000's how so many of us complained about Mega Man being in way too many games and seeing way too many releases? Oh, if only we knew then what we know now. 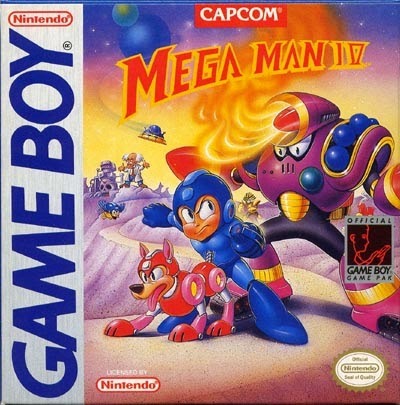 Today, Mega Man is pretty much intentionally forgotten by Capcom, the series's publisher. Hell, Nintendo is doing more with the franchise than its own publisher is, and that doesn't just include Mega Man's entry in the Super Smash Bros. series with this year's Wii U and 3DS entries. It also includes many of Mega Man's games being released on the Wii U and Nintendo 3DS Virtual Console marketplaces. The latter is where the fourth Mega Man game for the Game Boy finally gets another chance to shine, Mega Man IV. For its low entry price, Mega Man IV is like a fully charged Mega Buster shot-- it's a blast. The core of Mega Man IV remains unchanged from past Mega Man titles, both on the NES and on the Game Boy titles that preceded it. Mega Man runs, guns, and jumps through linear platforming stages, taking on the Robot Master that serves as the last challenge of each level. Defeating the Robot Master endows Mega Man with its special weapon. This special weapon can be used as a helpful tool in completing levels, and it also serves as a weakness to another Robot Master. Finding the right weakness to the right Robot Master is essential for making the game easier on the player. The ability to choose whichever Robot Master level you want to play in whatever order you wanted makes for the ability to make Mega Man IV as easy or as challenging as you'd like. Mega Man IV reuses NES Mega Man bosses. Of course, back in the day, one would have to play through an entire level and use a given special weapon on a Robot Master to see if it would be weak against it. If not, the player would either have to do their best with just Mega Man's Mega Buster (which can now be charged), or intentionally die and try a whole different level and Robot Master to go up against. This trial and error could really be a pain, playing through entire levels only to find out that that stage's boss isn't weak against any special weapon you have. Thankfully, you can use a guide to see the recommended order of Robot Masters for Mega Man IV (and be a scrub in the process). 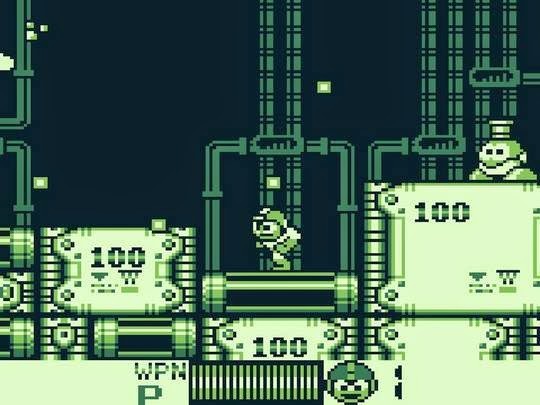 A new feature for this Game Boy installment of Mega Man (and for the series in general) is the inclusion of a shop feature. Once a level has been cleared, Mega Man ventures to Dr. Light's lab and can use the P-Chips (Power Chips) collected in stages to purchase a whole slew of item types. There's health and weapon energy restorative items, energy tanks, 1-ups, and more. This makes the oft-challenging Mega Man IV less of a frustration. Though, no item will save you from poor jumps, particularly into spikes, bottomless pits, or into a wall that crushes poor Mega Man. in levels can be used to purchase items. 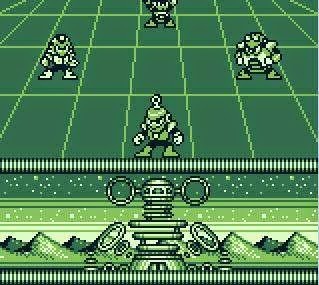 At the start of Mega Man IV, there are four Robot Masters to choose from. The first four Robot Masters in the game are all from the NES version of Mega Man 4. These levels each house one of four letters, B, E, A, and T. Collecting all four unlocks Beat the bird, who made its debut in this game and would make multiple appearances in Mega Man's many sequels. Meanwhile, the latter four Robot Masters are all taken from Mega Man 5 on the NES. Unlike the letters in the first four levels, these levels require you to collect all four letters-- W, I, L, and Y, in order to unlock the last series of levels in the game. 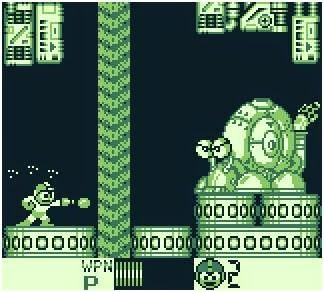 Since the Game Boy screen had much less space to it than a television screen, rooms in the Game Boy Mega Man games were much smaller, meaning larger sprites and less real estate per screen. That said, even with this perceived handicap, levels in Mega Man IV are well designed and seldom feel unfair. Well, Crystal Man's notwithstanding, which is a stage that ups the difficulty to astronomical levels in comparison to all of the other Robot Master levels in the game. to fold 'em. Know when to run away. Alongside this baffling jump in difficulty, most levels do not feature enough checkpoints in them. This makes repeated deaths frustrating, especially when you die at the same spot that you spent another five minutes getting to. These spots are usually just before a checkpoint, as if the level designers wanted their cruelty to be their legacy long after their deaths. Much like discovering the weaknesses to each Robot Master, Mega Man IV is trial and error. An important part of its challenge is redoing stages, learning from your mistakes, and going for that perfect run. This makes the game a lengthy one in that regard. However, with the Nintendo 3DS Virtual Console's restore points, you can cheese your way through the game, reloading the restore point when you die. It's like it never happened! 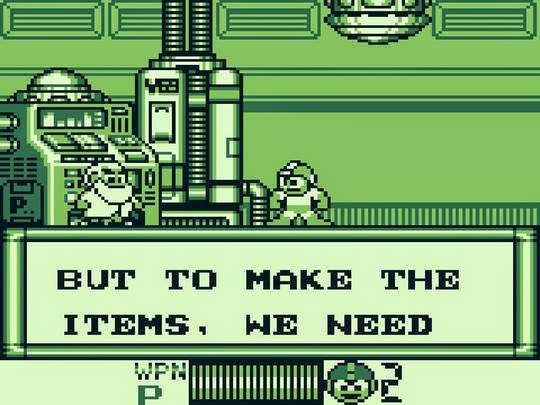 Doing so, though, will rob you of the sense of accomplishment Mega Man IV gives you from succeeding due to skill rather than perseverance with the restore point option. if you use restore points. Mega Man IV is a worthy entry in not just the Game Boy line of Mega Man titles, but it also keeps up with the home console releases as well. Some intentional design choices to make the game challenging will frustrate many younger players (heck, and even some older ones, too), but overall Mega Man IV is a blast to play and oh-so rewarding to overcome each challenge it shoots at you.